Providing caregivers with immediate access to a patient’s information not only improves quality and safety, but also reduces variation in patient care by using best practices. And, it improves care coordination across various practices. Knowledge-based charting supplies instant access to tremendous amounts of patient information via computers at patients’ bedsides. All of the information now included in patients’ paper charts is housed electronically. The system features nearly 200 evidence-based, interdisciplinary clinical practice guidelines developed and regularly updated by the Clinical Practice Model Resource Center, a national consortium of hundreds of hospitals and educational institutions. The guidelines cover the gamut from the general e.g., the pre-operative period, to specific diagnoses, such as stroke. The system also evaluates potential changes in patient status and uses automatic screenings to alert clinicians to circumstances that increase the risk of things like pressure ulcers, falls, and blood clots. 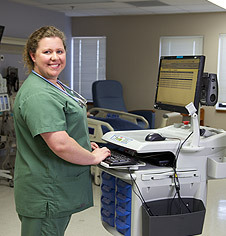 With KBC, physicians, nurses, and other health care professionals (such as physical therapists, lab techs, and social workers) are able to electronically insert information including vital signs, histories, lab and radiology results, and patient education information. Each discipline will have its own documentations section but everyone will have access to common information, such as history, allergies, and immunizations.